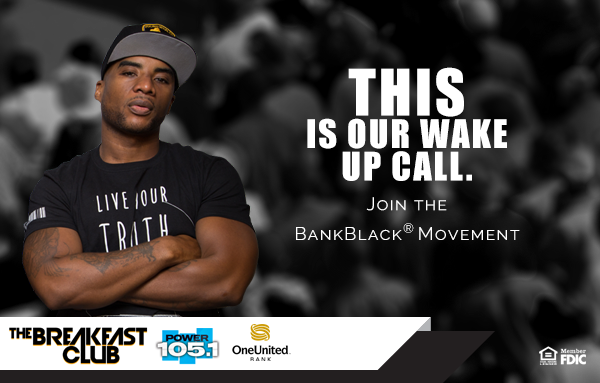 OneUnited Bank (www.oneunited.com), the largest Black owned bank in the country, in partnership with iHeart Radio Power 105.1, The Breakfast Club and Charlamagne Tha God, is proud to announce our new program to expand the #BankBlack Movement. Paralleling the Civil Rights Movement whose message was voiced through local and national newspapers and magazines of its time, the #BankBlack Movement needs partnerships to amplify our voice. Charlamagne Tha God, The Breakfast Club and iHeart Radio Power 105.1 provide a vital wake-up call for the urban community. They are respected because they speak authentically and do not kowtow to anyone. After working with their team over the past few months, we know that they understand the importance of collective economics for our community. In order to succeed, we must not only move our money and our minds to #BankBlack, we must commit ourselves to #BuyBlack and support Black-owned businesses, #BuildBlack, and buy real estate in Black communities, or #BuyTheBlock. Many of us have bad credit. We are being turned down for jobs, home loans and car loans every day. OneUnited Bank offers the UNITY Visa secured credit card…or The Comeback Card, to help people rebuild their credit. It reports to all 3 major credit bureaus. To take risk and build wealth, we need to have savings. Yet many of us are living pay check to pay check. OneUnited Bank offers affordable savings accounts and encourages our community to open automatic savings accounts, to teach ourselves to save. The Black homeownership rate nationwide is 30% below the White homeownership rate…our rate is 40% to their 70%. OneUnited Bank promotes financial literacy and home loans to help our community #BuyTheBlock or invest in real estate. In short, the Black community must use its $1.2 trillion in annual spending power more purposefully to build wealth. We are pleased that the #BankBlack movement and financial literacy have been promoted by Killer Mike to Jay Z. We are excited that Charlamagne Tha God, The Breakfast Club and iHeart Radio Power 105.1 will help us keep the conversation going! When you hear our message…give us your feedback and join the #BankBlack Movement today! I am so proud of this movement. I think one of our biggest economic issues in the black community is being able to trust each other. If we can help each other ensure quality products then it wont just be black buying black but white, brown, blue buying black too! I am not black, but i compleatly understand the struggle. It is not fair for any race to be more superior then another, but i would like to help if i can by opening a checking account. Martin Luther King Jr. told us what to do in his last speech two days before he was assassinated. He said "withdraw economic support" from the system and 'deposit our money in Black owned banks.' He also said we should patronize Black owned businesses. Many don't realize he actually said those things just before he was assassinated. So our ancestor gave us the blueprint to economic power. Glad to see more and more are waking up to it and taking action. What about Black Business? it seems that you cannot open a business account with One United unless you live where a one United branch is located. But not all Blacks live in America live where there is a one United Branch. Black Business and supporting Black Business is just as important to our community. How can One United support the movement and yet Ostracize Black Entrepreneurs who are trying? The only alternative is to open a business account with one of the white institutions like Wells Fargo or Chase. But who wants to do that? I rather support my people. With the advent of the Internet, having a business takes on new meaning. One United should offer Business banking online. If the business is legal, then whats the problem? Hi Mike. Thank you for your interest in opening a business banking account with us. At this time, we can only open business accounts at one of our branches for businesses that are located within the same state as the branch. As we grow and evolve, we hope to add new products and services to our online offerings nationwide, so please stay tuned for news and updates periodically on our page.